Special 3-4 is the fourth level of Special 3 in Super Mario 3D Land. The level is based off World 7-2. The player starts out in a room where ahead of them are several Spiked Cylinders. After passing these the player will encounter a Boomerang Bro and then more Spiked Cylinders that they must pass. 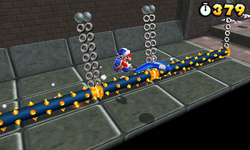 The player will then encounter another Boomerang Bro and more Spiked Cylinders before reaching a Door that they must go through. After going through the Door the player will find the Checkpoint Flag and will then need to follow a path upwards that takes them to some Tilting Platforms where they must avoid some Spiked Balls before entering a fortress-like area with two Boomerang Bros., after the Boomerang Bros. the player will receive a Boomerang Flower. The player will then need to jump over several platforms and Donut Lifts that have Spiked Cylinders rotating around them. The player will then find a Door to the final area. In the final area the player will have to jump over three sets of Donut Lifts that have Spiked Cylinders circling them, the player will then reach the Goal Pole. Star Medal 1: Floating above two Spiked Cylinders before the door. Star Medal 2: After the tilting platforms, the Star Medal is floating outside the entrance of the fortress, the player should Wall Jump to get it. Star Medal 3: Floating above the Donut Lifts.